So many times in our homes we find ourselves thinking of what makes us happy. That makes sense, a home should make us feel happy! But if making ourselves happy is all that creating a home is about, how happy will we really be if we never open our home or heart to others? For a deeper level of happiness, we can use the wonderful talents we’ve been given and even the homes we have to bless someone else. I’ve always loved the opportunities I’ve had to host get togethers and bring people together in our home. Our rickety nearly-antique dining table isn’t big enough to hold a large crowd, so for holidays and dinner parties we often have to bring up a card table to extend the surface out to the living room. We toss a tablecloth over it and make one big happy table! It’s not fancy, but it brings together what matters the most. Lots of memories, good food to nourish us, and the people we love. Isn’t that our hope in creating a home? That we could freely open the door wide and invite people in to gather in a warm and welcoming space? No apologies, no fears, no stressing out over the size of our home or table, or trying to outdo ourselves or impress anyone for the holidays. Just creating a place where we can truly care about people! 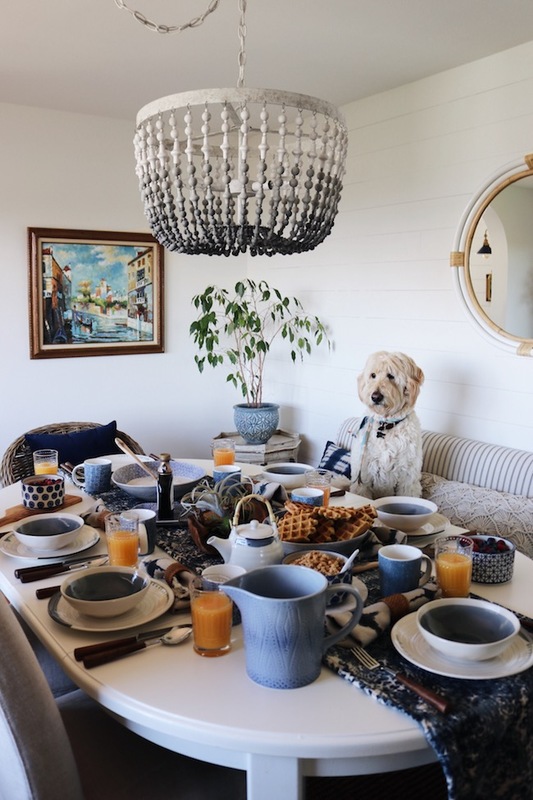 Blogging and social media opened up a whole new opportunity to impact people and connect with others all over the world, right from our own home or dining table. Hearing from people you’ve connected with online is like opening a letter from a friend — you can’t wait to see what they have to share. They challenge us. They enlighten us to see new things. They reach out and connect with us. Even though we don’t necessarily all get to literally hang out in my house or yours, I’m so glad that we get to meet up here on The Inspired Room (and share our similar interests in the home!). Twelve years after starting this THING called a BLAWG, I am still in awe that this is even a thing we get to do! I love sharing with y’all here and hearing from you in the comments and emails each week. Honestly, if I don’t hear from you in awhile (or you’re just lurking! ), I miss your comments and the camaraderie that grows from that connection. It’s the interaction between humans that makes a blog or social media feel like a gathering of real-life friends. A way to personal happiness is to think more about how to make others feel at home. Big thanks to those of you who invest yourselves in an ongoing connection with me! I always love hearing from you. I am so grateful you take the time follow along, whether you gather on this blog (or social media), read my books or are a part of my community! To follow me on social media or join my Dwell Well community, visit this page here. To read more of my home-related books, go here. As I mentioned in my previous post, I used to suffer from Magazine Cover-itis. If you look it up in the doctor’s disease manual my picture is right there by the description. Someone who suffers from this disease worries about the magazine cover potential of their house from every angle. Even if it is for their own visual delight and not for show, it is important to get a proper perspective about this. As I have grown up a bit (reached the big 4-0) I am much more comfortable in the journey and acceptance of my own limitations and reality that I must work with. I guess I am just more aware of what I am doing, why I am doing it and the focus has changed. The authenticity of the life behind the cover shot has become my driving force in the creation of my home. The goal for me is not “magazine cover ready,” but that will be a likely result in time! I get almost giddy about that thought — I know, it seems contrary to my magazine cover-itis recovery process, but the reality is beauty in my surroundings makes me happy! I am simply going about my life, making things work for my family and making practical things as attractive as I can, and suddenly I look around and say, “Hey, look at that, my room looks as pretty as a magazine cover” (Well, I usually only say that when I am having a party. The other days I am thinking “NO ONE would leave pb&j crusts and socks on the table for their photo shoot, so call off the cameras because today is not a good day for it!”). And, really, not having a good day for a photo shoot means you are involved in the regular everyday business of living. Bill paying, working at home, laundry and cleaning, children, pets and cooking aren’t always conducive to magazine photo shoots — nor should they be. Photo shoots are staged. Life is more spontaneous and unpredictable — yes, messy. But you really can live in a way that is personally enjoyable to you, allows you to fully and comfortably live in your home AND be able to say your home is as pretty as a picture (minus a few stray socks here and there) no matter what your budget or limitations are. It is not about the money or where you shop, but rather the art of living with grace & beauty in ways that make sense. In general, always ask yourself “why am I buying this or why do I need this?” about everything you add to your home. If the answer is that you are trying to recreate someone else’s room or even subconsciously trying to impress someone (or yourself!) with what you have or where you bought it, STOP! That won’t make you happy for long. Don’t buy things unless they serve a needed purpose and because you either love it or will love it once you fix it up a bit. If you know you will never “get around to it,” don’t buy things that need more help than you are willing to give. Better an empty space than something ugly you will never get around to beautifying. Create layers over time. Rushing to complete at room at lightening speed will end up with the room lacking the ingredient of authenticity you need to have a truly beautiful home. Authenticity requires time and real life to create. Authenticity requires problem solving and addressing needs that come up over time. It is more about designing your life — each new experience and need adds beauty to your home. Enjoy the process of layering. Don’t apologize for being “in process” — most of us are! The best rooms take time. Let rooms evolve the way they want to. When you try too hard to force a theme or a style on a room, things just don’t come together in a real and pleasing way. Get real about the style of house you have, the type of furnishings you already own and what really makes sense in your home. As you add new things and move other things around, rooms evolve all on their own. You don’t have to start out with a “plan”! That isn’t usually a realistic way to do a room (again, unless you have a perfect room, no furniture yet, money is no object and creativity is not going to be a part of the equation). My rooms rarely start from a plan, rather they start from one non-negotiable feature, problem to solve, or piece of furniture I already have, and they begin to evolve based on the solutions I can come up with and the delightful things I stumble upon over time at affordable prices. I really will not know what twists and turns the room will take until later on. I am always pleasantly surprised! Re-purpose things. I have found fabulous things for my home at designer resale shops, garage sales or in my own house that ended up in a completely different room or used in a different way than I originally thought. No need to go out and buy a bunch of expensive accessories or furnishings. 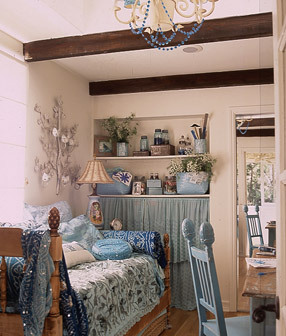 Repurposing adds to the reality of living and adds a dose of unexpected charm. 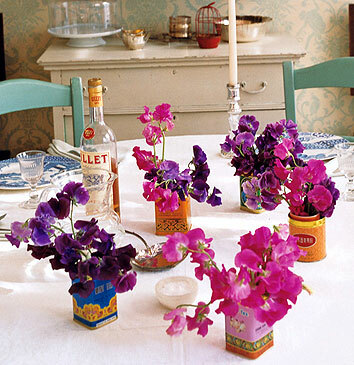 Look at these quaint vases, re-purposed and so pretty! Also notice the simple painted dresser and chairs, put together to create a charming dining space. You’ve heard it before, but I’ll say it again: Paint and color coordination are always a solution. Paint covers a multitude of mish-mash. If you are just not feeling like your room is “coming together” why not find a delicious paint color and sweep it over a number of things? Look at this pretty picture. Note the baskets got a coat of paint right along with the chairs! This shade of blue is given to a number of objects, bringing it all together. Color can solve problems with little or no money. And look at this bold room. By adding color to a wall in a room with really very little furniture or accessories you can pull a room together for the cost of paint. Re-arrange. Most people have lovely things; they just are not arranged in a way that is pleasing. Sit in your furniture; look at your room from different angles. Even take pictures of your room so you can see what it really looks like. Look at the ceiling, the walls, the floors, the doors, the windows, the shelves, and the furniture. Do you see order and beauty when you look around or do you cringe when your eye lands in some corners? Tweak things until you are satisfied by beauty and comfort, or have a professional help you look at things in a new way. You can’t be comfortable in a room that has too much stuff, doesn’t flow with the house, is lacking attractive things, or isn’t set up for conversations or real living. If you have rooms you never use, why not put different furniture in there and mix things up a bit so you will have reason to use it? Make your home suit you both functionally and visually and it will become pretty in the process. These were just a few ways to combine a desire for beauty AND authenticity in your home. “Decorating” with this approach is not focused on interior design, perfection or popular style but on what makes sense and what is pleasing to YOUR eye. Do you struggle with any of these things? Feel free to share your stories or questions and I will try to address things that might help. Everyone has their own unique style but we all are happier and more productive when our surroundings reflect our own personal beauty. For some, this process is easier than for others. What are your personal challenges?